Esther was born in a family of four girls and one boy, as a third born child. Both their parents died when all these children were very young to comprehend what was happening. They were all rescued and placed in different children homes. Esther with the younger brother were placed under the care of Sons of Manase from their early days and this is the place they know as home up to date. Despite having a difficult childhood, she is very jovial in nature and academically inclined. She has always been determined to make life better for other people and this has driven her to be a very hardworking young girl. She has been under constant guidance to make the better choices and being one of the older girls at the Children’s Home, she has always taken care of the smaller children as they are her younger brothers and sisters. This has helped develop a sense of maturity and responsibility, two factors that she attributes to her smooth sail through school. She did her University entry examination in late 2015 and performed strongly, allowing her be accepted into a public university this year. Moja Tu is looking to find a sponsor for her to join the University which she is eligible to join in just a few months, Sept 2016. She dream is be an accountant and we hope she gets an admission for a finance related course. As she awaits to join the university, she has been very helpful at the children home as she helps all the primary going students to hold extra classes in the evening and attend to their school homework. All on her own. When the Secondary students are on break, she helps them to revise for the course work they covered during the term. She is very helpful and her kind heart has seen her attract the attention of well-wishers who constantly helped to raise school fees for her to attend secondary school. While she awaits her next steps, she has been helping as a volunteer at the Children’s Home, tutoring the younger students, washing clothes, helping with the younger children and more. She is a very dedicated and determined young girl who wants to succeed and give back to the world. Esther would be our first Moja Tu female University student. 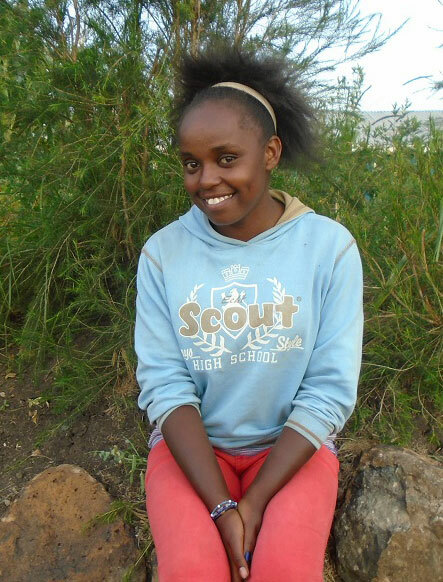 Sponsorship for Esther is $150/month for her 4 year program. During this time you would get frequent updates regarding her performance in school and have the opportunity to interact with her personally. Meet Margie, Our Secret Weapon! Discover more ways you can support our students. Receive our monthly newsletter and occasional event emails. we promise not to spam you or sell your email address.